“I won’t characterize… what the Chinese capabilities are. I just will tell you that we know what they are,” Gen. John Hyten said in a 60 Minutes interview in April. WASHINGTON — The U.S. Defense Department is suggesting that the May 2013 launch of a Chinese rocket that it branded at the time as suspicious was a test of a technology designed to counter or destroy satellites in geosynchronous orbit. Image of the May 13, 2013 launch from Xichang taken from Hong Kong. Credit: Wah! China characterized the launch as a scientific sounding rocket mission, but the U.S. Air Force said the vehicle’s trajectory was inconsistent with that explanation. In a statement released shortly after the launch, the service said the rocket climbed to a nearly geosynchronous-orbit altitude — 36,000 kilometers high — but that all objects associated with the launch subsequently re-entered the atmosphere. In its latest annual report on Chinese military power, released May 8, the Pentagon doubled down on its initial assessment. Air Force and Defense Department officials have repeatedly warned over the past year about growing Chinese and Russian threats to satellite capabilities. In the case of China, these officials have primarily cited two events: China’s deliberate destruction in 2007 of one of its own low-orbiting satellites with a ground launched missile; and a “nondestructive” anti-satellite test in 2014. In its latest “Annual Report to Congress: Military and Security Developments Involving the People’s Republic of China 2015,” the Pentagon said the 2014 launch had a “similar profile” to the 2007 launch. Chinese officials described the 2014 event as a missile defense test. The Pentagon had been largely mum about the 2013 launch between its initial assessment and the release of the new report on China’s military. But independent observers have been less restrained. “While there is no conclusive proof, the available evidence strongly suggests that China’s May 2013 launch was the test of the rocket component of a new direct ascent [anti-satellite] weapons system derived from a road-mobile ballistic missile,” Brian Weeden, technical adviser to the Secure World Foundation, a nonprofit organization dedicated to space sustainability, said in an analysis released in March 2014. According to a 2013 press release from the Chinese Academy of the Sciences’ National Space Science Center, the sounding rocket was launched from Xichang Satellite Launch Center and carried payloads for studying the high-energy particles in the upper atmosphere and near-Earth space. Martin: These follow on Chinese tests, how high up do they go? Martin: Well, how high’s that? 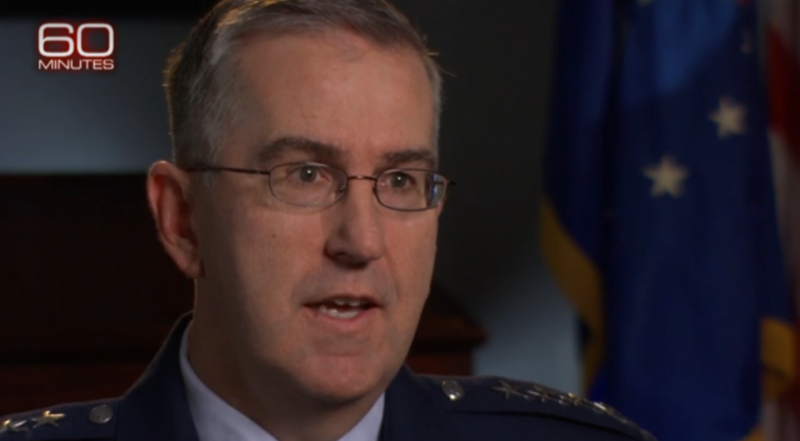 Hyten: I won’t characterize what– what the Chinese capabilities are. I just will tell you that we know what they are.